With the Olympics looming on the calendar, the FEI is prominent in the news. But today's story is not about dressage star Totilas or Kiwi eventers or even showjumpers in Rome. The FEI is entering the international horse welfare arena with a farrier education project. World Horse Welfare (WHW) reports that the organization will be working in partnership with the Cambodia Pony Welfare Organisation after being awarded a grant from the International Equestrian Federation (FEI) to help train farriers and harness-makers in Cambodia. The grant is part of the FEI’s Solidarity development program launched in 2010 to engage and support the organizations national equestrian horse-sport federations by creating, supporting and expanding projects and programs from “grass roots” to elite level throughout the global FEI family. Working ponies in Cambodia are part of a two-level education program for the Asian nation. It is the first time that World Horse Welfare has worked in partnership with another welfare organization in this way, and the first WHW project in this part of South East Asia. The first module has now been completed: representatives from World Horse Welfare, farrier Tom Burch and saddler Stuart Russell, shared their knowledge and skills with local Cambodian farriers and harness-makers. The training course is taking place in the country’s capital of Phnom Penh, where ten students will be taught the sort of advanced farrier techniques that will allow them to work with horses used in international sport and then train local farriers. A further four students will study saddlery and harness making techniques with the intention that they pass on their newly-learned skills to other service providers and horse owners in Cambodia. 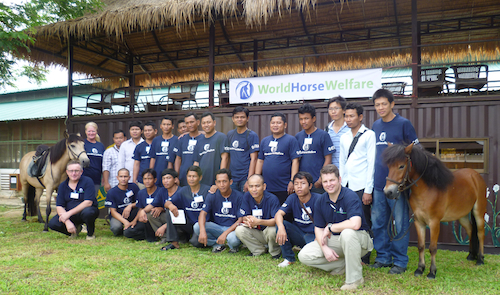 Head of Program Development at World Horse Welfare, Karen O’Malley said: “Although the Cambodia Pony Welfare Organisation is carrying out farriery training, it was felt that with this funding we could complement the work of the organization and further advance the skills and knowledge of the trained service providers. Saddler Stuart Russell concentrates on harness and saddles used in Cambodia. Chief Executive of World Horse Welfare Roly Owers said: “We have decided to take our international work in a different direction in order to make our training programs more sustainable in the countries we are operating in. Therefore, the focus is more on creating in-house service providers so that local people can transfer their skills onto to other local people. 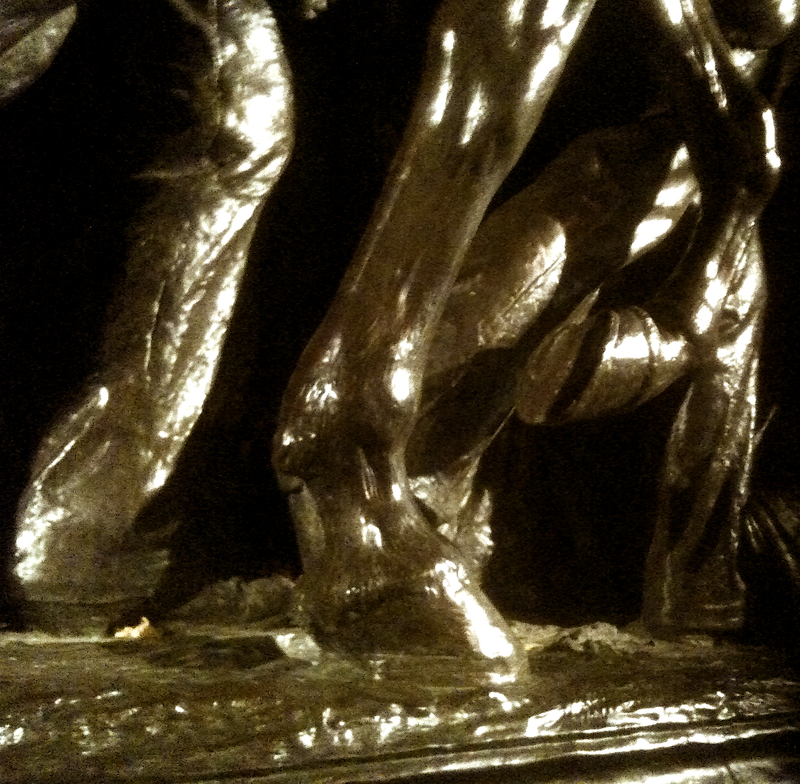 A brief excerpt from a PBS documentary on the sculptor Saint-Gaudens, who created the Shaw Memorial on Boston Common. We take it for granted 364 days a year but Memorial Day seemed like a good time to stop and take a closer look. What memorials are in your town? I don't know how many times I have walked by this statue--hundreds?--and never stopped to think much about it. It's part of the fabric of the city. We learned all about it in school. 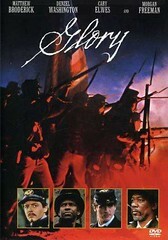 I saw the movie "Glory", which was Hollywood's version of who these people were. You probably saw it too. relief sculpture. It's not exactly 3-D. It's more like 2.5-D. And hard to do. This is the best my iPhone could record in the dark. But the other night I stopped there at the top of Boston's Beacon Hill because I was taken with the horse and I wanted to see it close up. It struck me that the foot soldiers are all leaning forward. But the rider and horse are not. In fact, they seem a bit hesitant. The horse's ears are back. That's when I decided to start doing some more reading. And start forgetting Hollywood. As soon as the Civil War began, African-American men in the North tried to enlist in the Union Army. They were turned away. Then it happened: it was two years into the bloody war, in 1863. Massachusetts, the hot bed home of the abolitionists, received permission from Washington to form a Black regiment. They knew was they were up against. Confederacy policy was to enslave any captured Black soliders. The governor of Massachusetts assured them that African American soldiers would be treated equally; they would receive the same pay and the same benefits as white recruits. Only white men, however, could serve as officers. 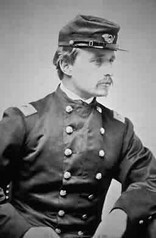 Colonel Robert Gould Shaw, the only son of one of Boston's leading abolitionist families, would lead the regiment. He was only 25 years old. much more aware of the 54th. On May 28th, the regiment was ready to fight; they marched through the streets of Boston, to the cheers of thousands of well-wishers the same way we lined the streets when the Red Sox won the World Series. 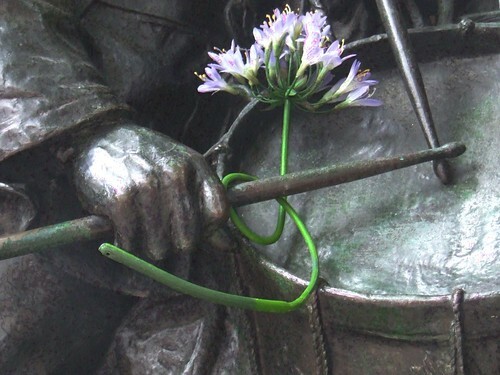 This is the moment memorialized in the sculpture. They marched right to the docks and boarded ships headed south. One of their first engagements was on July 18th at Fort Wagner, in Charleston Harbor in South Carolina. Colonel Shaw led 600 men up the embankment. Almost half his men were killed, wounded, or captured. Colonel Shaw was shot through the heart; the Confederates buried him in a common (unmarked) grave alongside 74 of his men. His parents said he would have wanted it that way. The War Department, meanwhile, did not deliver on the governor's promise to the soldiers. The men of the 54th were paid only $10 per month--$3 less than the white soldiers. So, they decided if they could not receive equal pay, they would accept no pay. For 18 months, soldiers could send no money home. In turn, they received heartbreaking letters from their impoverished families back in Massachusetts. Finally, in July 1864, Congress acted to give African-American soldiers the equal pay they had been promised, retroactive to the date of their enlistments. In winter, the three-dimensional relief sculpture comes to life. They march on. Memorial Day was declared a holiday in 1868, so that Americans would stop what they were doing and place flowers on the graves of fallen soldiers--a custom that began in Mississippi. It was called Decoration Day. On May 31, 1897, 60 veterans of the 54th Regiment were among hundreds of people who gathered on the Common for the unveiling of the memorial. 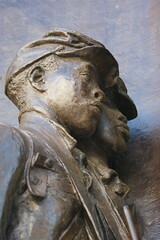 This bronze relief statue, which took the leading sculptor in the United States 14 years to create, is considered one of the greatest works of public art in the United States and was the first to portray black men in uniform. Sculptor Saint-Gaudens' original plan was to craft a magnificent equestrian statue of Shaw--alone on his horse, on a pedestal. But Shaw's family wouldn't hear of it. 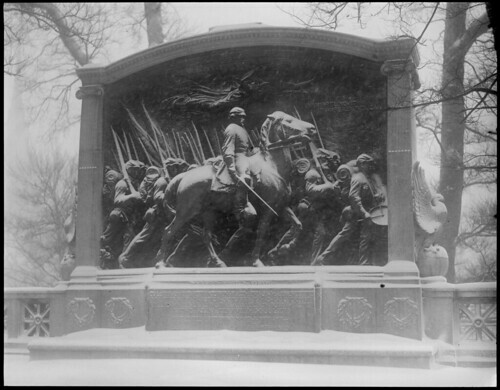 Saint-Gaudens bought into their line of thinking and designed the first public sculpture to show an officer and enlisted soldiers together. And, probably, blacks and whites together. It was commissioned by the black citizens of Massachusetts, who raised funds to pay Saint-Gaudens. I'm just not sure why it is called the Robert Gould Shaw memorial. I hope someday I'll hear that its name will be changed to honor the whole regiment. When it was unveiled back in 1897, people could read the names of the five white officers killed in battle; they were inscribed on the back of the monument. It wouldn't be until 1981 that the names of the fallen black soldiers would be carved into that stone. Thanks to Mass Moments, a history website that inspires every day. A farrier in England has faced two prosecutions for professional misconduct after he was found to have crudely remove one front shoe from each of two event horses owned by a former client. In court for criminal damages, the farrier "was convicted of cutting the shoes off both animals other than in the ordinary course of farriery, which damaged them" according to a local newspaper account, which included photos of one of the feet and said that the shoes were removed on two occasions, two weeks apart. Apparently he received a suspended sentence and paid compensation of about $500US. The second prosecution was by the Disciplinary Committee of the Farriers Registration Council, the British government agency charged with enforcement of the Farriers Registration Act, and which found the farrier guilty of serious professional misconduct and suspended him from the Register of Farriers for three months. For accuracy, the text that follows is from a transcript from the Farriers Registration Council, with names removed. 1. (a) On 21 July 2011, at the Cheltenham Magistrates Court, you were convicted of criminal damage on 23 February 2011 to the front left hoof of a horse named Arron, intending to destroy or damage such property or being reckless as to whether such property would be destroyed or damaged, contrary to sections 1 (1) and 4 of the Criminal Damage Act 1971, for which offense you were discharged conditionally for 12 months and ordered to pay compensation in the sum of £220.80 and costs in the sum of £85.00. 2. 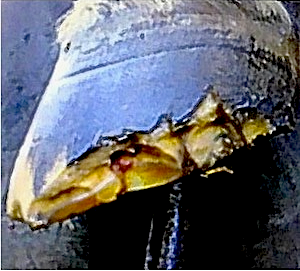 On 23 February 2011 the criminal damage referred to in paragraph 1 above was such that: (a) you removed a shoe from the front left hoof of Arron without the consent of (the owner), knowing that you were doing so without such consent; and/or (b) you removed the shoe by cutting it off; and/or (c) you removed the shoe other than in the ordinary course of farriery; and/or (d) you caused damage to Arron; and/or (e) you caused unnecessary suffering to Arron. 3. On 7 February 2011 you removed the shoe from a horse named Eric belonging to (the same owner) and in doing so: (a) you removed the shoe without the consent of the owner, knowing that you were doing so without such consent; and/or (b) you removed the shoe by cutting it off; and/or (c) you removed the shoe other than in the ordinary course of farriery; and/or (d) you caused damage to Eric; and/or (e) you caused unnecessary suffering to Eric. A veterinary surgeon who had attended Arron confirmed the damage to the horses' hooves would have caused both horses pain on walking and unnecessary suffering. The horses required specialist farriery care over many months following the incidents; for Arron this is still ongoing. ...In addition, the horses were no longer under the Respondent's care and there was no reason for him to be with the horses: the Council would submit that this behavior must have been pre-meditated. The farrier showed remorse for his actions, admitted all the facts outlined above and that they amounted to serious professional misconduct but offered no explanation. After full consideration of the facts, the Committee found him guilty of serious misconduct in a professional respect and directed that he should be suspended from the Register for a period of 3 months. The farrier's suspension took effect on Thursday 24 May. It will be illegal for him to practice farriery during that interval and to do so will be a criminal offense. He is still subject to a conditional discharge following the magistrates hearing on 21 July 2011. The following news item is reprinted for educational purposes. Toxic black walnut wood shavings sold as bedding caused an Arabian horse to develop laminitis, a Texas ranch claims in court. An Arabian horse developed laminitis in August of 2011, according to the complaint in Bexar County. The ranch says it reached out to a veterinarian when the horse exhibited pain and swelling in its legs and sheath area. While examining the stable, the ranch allegedly noticed dark wood shavings with a distinct smell. The ranch claims it had just switched out the wood shavings the day before, putting in a batch from a livestock product supplier,which obtained the bedding from a hardwoods product manufacturer. It is possible that as little as 10 percent black walnut shavings can cause laminitis in horses. The entire bedding does not need to be dark-colored. The black walnut can look like threads among the lighter colors. 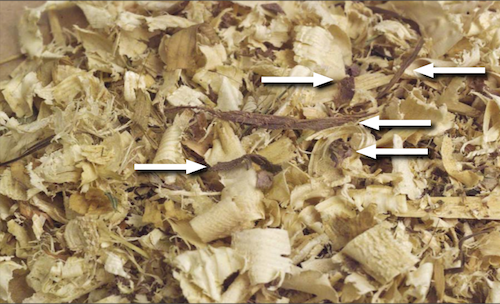 Photo from Purdue Extension special report on black walnut shavings and laminitis. Once the veterinarian diagnosed the horse as suffering from acute laminitis, he tested a sample of the bedding, according to the complaint. The ranch says the supplier identified various woods that might explain the dark shavings, first naming elder, then cherry and mesquite. But the Texas Veterinarian Medical Diagnostic Laboratories Systems at Texas A&M University ran more tests and identified the true source -- black walnut -- a wood known to cause laminitis when used as horse bedding, the ranch says. The supplier later "admitted that earlier in 2011 another shipment of shavings from (the manufacturer) had contained black walnut and caused a similar incident with another one of (the supplier's) customer's horses," according to the complaint. The ranch seeks exemplary damages for negligence, deceptive trade practices, breach of warranty and product liability. It sued the livestock supplier, the hardwood manufacturer, and its owners. The horse is undergoing medical care, but its owners say they cannot show or breed the horse. This report was provided to the Hoof Blog by Courthouse News Service. The complete transcript of the lawsuit can be downloaded as a pdf file: Texas laminitis black walnut shavings lawsuit. Watch the Hoof Blog for the outcome of the suit. To learn more: Download the Purdue Extension special report on black walnut shavings and laminitis. MAY 18, 2012--Hoofcare Publishing is asking the blog readership for assistance. The developer of a promising medication to improve the prognosis of acute laminitis cases is seeking a collaborator in the field who has a case that has just been diagnosed. The medication is a mast cell inhibitor (stabilizer) that has been FDA-approved for use in humans. It is designed to inhibit the release of inflammatory mediators from the cells involved in laminitic reactions and has been successfully tested as a medication for induced laminitis in cattle, sheep and horses in university and private test studies. The developer now needs some clinical tests of the drug, which ships in solution in a vial. It is injected into the foot via retrograde venous therapy, similar to the way that antibiotics are injected into feet with infections. A tourniquet is used at the fetlock and the medication, in solution, is injected into the digital vein. Only acute laminitis cases are being sought at this time. Horses that have progressed to chronic laminitis are not suitable for this test. The medication is a mast-cell stabilizer, meaning that it inhibits the release of excess inflammatory mediators contained within mast cells. This is a much-studied area of immune-response medicine and other areas of disease pathways. The laminitis formulation also offers anti-inflammatory properties but must be administered only to horses that are not receiving Bute for therapy. A $75 formulation fee will be waived to a Hoofcare + Lameness blog reader who comes forward with a case to participate. a. Administer the drug via the retrograde administration instructions provided. b. Complete a Post-Treatment – Results Form – “5-Days” Post-Treatment. c. To allow study sponsor to contact horse owner to complete Post-Treatment survey. d. An owner-consent form must be completed. If you are interested in participating, please send an email to Hoofcare Publishing and the developer will contact you. ABC News broadcast a hidden-camera video this week, exposing the at-home training techniques of well-known Tennessee Walking horse trainer Jackie McConnell of Collierville, Tennessee. According to the ABC web site, the video was part of a recent Grand Jury indictment of McConnell and was shot by someone working on the trainer's barn crew while collaborating with the Humane Society of the United States. As a result of this video, Pepsi has withdrawn its sponsorship of the breed's largest show, the Tennessee Walking Horse National Celebration in Shelbyville, Tennessee each September. The Walking Horse Trainers Association (WHTA) has revoked McConnell's training license. WHTA did not have prior knowledge that the video existed or that ABC News planned to air it. Following the broadcast, the WHTA director quickly called a meeting to voice their reaction. The WHTA was quick to take HSUS and ABC News to task for comments made on the broadcast about the Walking horse's natural gait. McConnell, who was previously banned from training horses for five years by the USDA, has been charged with 52 counts by a Grand Jury but he entered into a plea agreement last week with prosecutors. In exchange for pleading guilty to one count of conspiracy to violate the Horse Protection Act, the other counts will be dropped. The charges dropped relate to horse soring, transporting and entering sored horses in show competitions and falsifying documents. The penalty for the one count could be a $5000 fine, up to three years in prison, or both. Horseshoer Joseph Abernathy was charged along with McConnell. The court agreed to allow him to continue to operate his farrier business, provided he report weekly on whose horses he has shod. Abernathy did not have any previous USDA violations on his record. One of the training methods shown on the video is called "stewarding". It teaches the horse to stand still and not flinch when its sore feet and pasterns are handled by inspectors (stewards). To learn more: Watch a video of a stake championship class for Walking horses at the Mississippi Charity Horse Show in Jackson last year. These horses all passed the anti-soring inspection before the competition. Click on the image for more information and online ordering. In Nordic mythology, the famous Sleipner was the eight-legged horse ridden by arch-hero Odin. Alexander the Great's Bucephalus was allegedly a polydactyl as well, and Julius Caesar is said to have preferred to ride a horse with extra hooves. Hold on to your hoof picks, the owner of this foal might need to borrow them. A mare at a petting zoo in Belgium has given birth to a foal with seven hooves. Three of the foal's limbs are equipped with what are called supernumerary digits. A year ago, the Hoof Blog splurged on a collection of bits and pieces from around the web about these unusual quintaped horses. We even found a Shire draft horse named "Norfolk Spider" with six hooves. It is unclear what will become of the foal in Belgium, partly because the information available is not in English and I'm hesitant to translate it with any certainty. It does sound like the vet school at the University of Ghent in Belgium is interested in obtaining the limbs, but it doesn't say that they are interested in the foal that is attached to them. Click here to see two of the seven hooves of the foal in Belgium. That photo is protected by copyright. Hopefully more photos will be available, and I will be able to post them here. Will the foal live or die? This is the kind of thing that people used to pay money to see on the midway at the fairs in Vermont. "The Two-Headed Calf" by Laura Gilpin was featured on the Hoof Blog back in August 2009 after I heard Garrison Keillor read it on NPR's Writer's Almanac. Good luck to the seven-hooved foal in Belgium. May he gallop his field with confidence some starry night soon. Thanks to @HorsUsNews for the news tip via Twitter. Painting of Sleipnir by Ahula Tinga. Carving of Odin riding Sleipner is at the Oslo City Hall in Norway; photo by Jaime Silva. In recognition of the American Association of Professional Farriers (AAPF) commitment to the farrier industry, the Calgary Stampede’s World Championship Blacksmiths’ Competition (WCBC) has named the AAPF as the permanent sponsor for the WCBC Horseshoeing Championship Trophy. This prestigious annual award goes to the individual showing the ultimate skill in the art and science of farriery, demonstrated during the competition against the best in the world in their chosen profession. In addition, the WCBC has recognized the continuing education platform of the AAPF, where farriers attending the WCBC as a registered competitor or spectator will receive AAPF Continuing Education Credits. “The Calgary Stampede WCBC organizing committee recognizes the AAPF as being a positive driving force in the farrier industry and is looking forward to a long and mutually beneficial relationship promoting the highest standards of hoof care in the world,” said Eric Swanby, chairman of the WCBC. “This recognition by the Calgary Stampede is a testimonial to the goals and objectives of our new association. We look forward to enhancing our relationship with the Calgary Stampede, its organizers and competitors. Further, this mutually beneficial alliance is indicative of the cooperation we plan to establish with other equine associations,” said Jeff Ridley, APF, CJF, TE, president, American Association of Professional Farriers. The 2012 Calgary Stampede’s World Championship Blacksmiths’ Competition will be held July 4 – 8 in Calgary, Alberta, Canada. Maybe this has nothing to do with hoofcare or lameness, but it has everything to do with the business we're in, the people we work with or for, and the horses in our care. International readers may not know who Boyd Martin and Neville Bardos are (yet) but I hope everyone in the hoof world will take a few minutes to watch this video and get to know them. Not since Zenyatta was on 60 Minutes before the 2011 Breeders Cup have we had this depth of publicity about a single horse. A few things are missing from this video: the other people in the background of this (hopefully) London-bound duo. The local "vet hospital" where Neville Bardos was treated after the fire was none other than New Bolton Center's George D. Widener Hospital for Large Animals of the University of Pennsylvania School of Veterinary Medicine in Kennett Square, Pennsylvania. Boyd was very lucky to have a place like that so nearby. The hyperbaeric oxygen chamber shown in the video would have been at Fair Hill Equine Therapy Center at the Fair Hill Training Center in Maryland. Neville's vet is mentioned several times in the video. That would probably have been Kevin Keane DVM, who is an event rider himself, and/or Dr. Mary Griffin of Griffin Equine; both were mentioned by Boyd after the Rolex Kentucky Three Day Event this year. “I believe the events that led up to, during and after the Memorial Day barn fire separate Lindsey from the rest of the list of candidates. This lady was able to deal with the tragedy of the loss of the horses that died, also rehabilitating the injured ones that survived, whilst working out of a number of barns, and was still able to fulfill her energy of the competition horses that were unaffected, all at the same time without complaint, negativity or fuss, which impressed me more than anything." 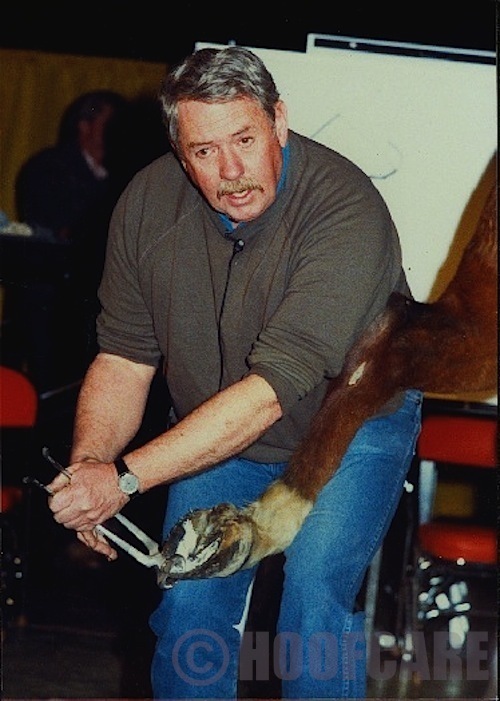 Last but far from least, Neville's farrier is sport-horse specialist Doug Neilson CJF of Chadds Ford, Pennsylvania. Doug has been shoeing for Boyd (and Neville) for the past four or five years, he said today. He also gave a resounding endorsement to this NBC segment on his client. Doug's farrier business featured in the Philadelphia Enquirer a few years ago. Boyd and Neville are off to New Jersey this week for the Jersey Fresh 3-star event. Is your reference library missing this important new book? Order yours today! Congratulations to horseshoer Jim Jimenez and the entire I'll Have Another crew. Dan Burke of FPD took this photo of Jim with the horse at Churchill Downs after the race. I'll Have Another ships to Baltimore's Pimlico Racetrack today to prepare for the next leg of the Triple Crown, which hasn't been won since 1978. I'll Have Another won the 2012 Kentucky Derby wearing Kerckhaert aluminum race plates. He was escorted to the gate by his esteemed stable "pony", champion (retired) racehorse Lava Man. Until the final furlong of the Derby, the stable pony was getting more press than the Derby winner. Now they're sharing the spotlight--along with, if Hoofcare and Lameness has anything say about it, the horseshoer and the shoes. A memorial service or gathering in memory of Scott Simpson is being planned for Saturday, May 26th, at 2:00 p.m., at the beautifully-restored Ellen Theatre in Bozeman, Montana. Scott Simpson was a very special horseshoer, educator, entertainer, horseman, author and many other things, including a father. He died on March 1, 2012 after finishing a round of golf at his winter home in Arizona. Scott taught the horseshoeing program at Montana State University in Bozeman for many years and still lived in Montana in the summer. The Ellen is a 100-year-old historic landmark located at 17 West Main Street in Bozeman. It looks like the kind of place where Scott would have been right at home, and fits perfectly for an "event" like this. The family will host a reception following the service. Anyone who has questions is welcome to contact Scott's daughter Howie. 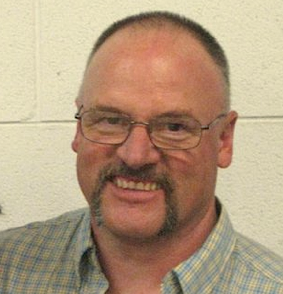 Read the Hoofcare + Lameness rambling but heartfelt tribute to Scott Simpson. The Ellen Theatre will be open on May 26, 2012 for Scott Simpson's memorial service. The biggest day of the year is here. What's going on behind the scenes at Churchill Downs in Louisville, Kentucky? The Hoof Blog has assembled a gallery of images for you that you probably won't see anywhere else. Thanks to Dan Burke of Farrier Product Distribution for his shots of horses being shod this morning. Place your bets, sip your julip and take an intimate look at a few hooves! That's a long apron! 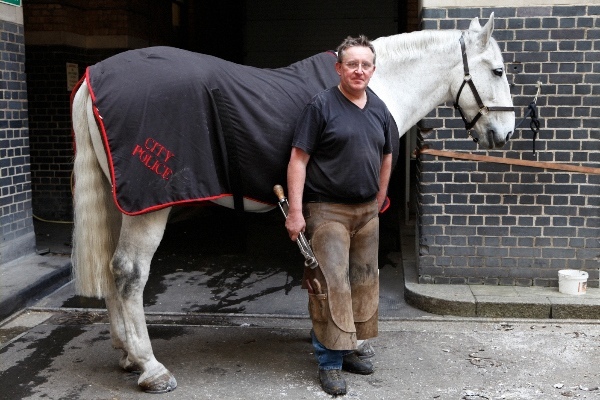 I think horseshoer Steve Norman, who is quite tall, wears such a long one because he often has shorts on underneath! This could be an historic photo; Steve is shoeing Winstar Farms' undefeated Gemologist for trainer Todd Pletcher. Dan stopped by the track kitchen and pointed out to me that the kitchen has been insured good luck always: a lone horseshoe hangs over the counter. Yes, the heels point upward because whoever nailed it there believes that they are holding the luck in that way. Back in the shedrow, Churchill Downs horseshoer Todd Boston lays a new Kerckhaert raceplate on a hoof of Prospective, trained by Mark Casse. Details, details: Churchill Downs knows the power of details. Where are you celebrating the Derby today? A vet's station wagon left open while he or she was working on the backside at Churchill. Tabitha Kaylee Hawk photo. Stormy skies interrupted yesterday's races. The horses were cleared from the track when lightning threatened. Steve Norman and his assistant work their way around El Padrino for Todd Pletcher. This horse has been below the radar the past few weeks. Which horse's name will go up on the paddock sign next?